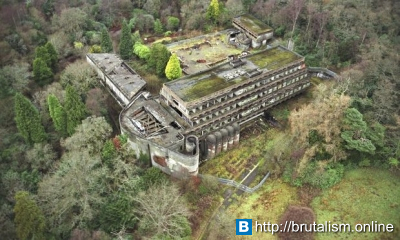 St. Peter's Seminary is a disused Roman Catholic seminary near Cardross, Argyll and Bute, Scotland. 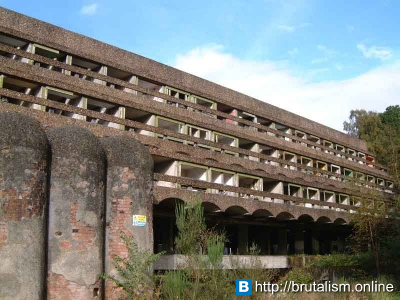 Designed by Gillespie, Kidd & Coia, it has been described by the international architecture conservation organisation DOCOMOMO as a modern "building of world significance". It is one of only 42 post-war buildings in Scotland to be listed at Category A, the highest level of protection for a building of "special architectural or historic interest". 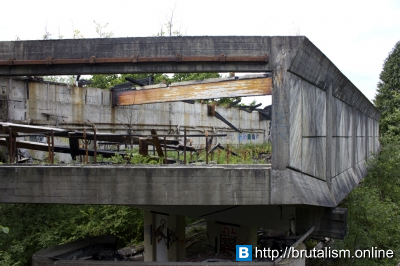 It has been abandoned since the end of the 1980s, and is currently in a ruinous state. It was announced in early 2015 that the site had been handed over to artist Angus Farquhar, with the intention that part of it will become an arts venue. Following a fire in 1946 at St. Peter's Seminary in the Glasgow suburb of Bearsden, a new home was needed for the seminary. Discussions began with Gillespie, Kidd & Coia in 1953, but the plans for a new college in the village of Cardross were not finalised until 1961, when building began. The college had since moved from Bearsden to temporary homes. The seminary's philosophy students were transferred to Darleith House in Cardross and the theology students to Kilmahew House. The plan was for a new building to accommodate all the students at Kilmahew House. It was a baronial mansion at the centre of the Kilmahew estate, a Victorian designed ornamental landscape created by the Burns family in the late 1800s. The mansion, built in 1865-1868, was originally a family home for James Burns and his son John, and later the Allan family, from the early 20th Century until just after the war, when the estate was sold to the Roman Catholic Archdiocese of Glasgow. Gillespie, Kidd & Coia employees Izi Metzstein and Andy MacMillan developed a radical design in which the old house would become professorial accommodation, and around it would wrap a striking new main block, a convent block, a sanctuary block and a classroom block. The old house thus became one side of a quadrangle, creating a bold juxtaposition between old and new buildings. 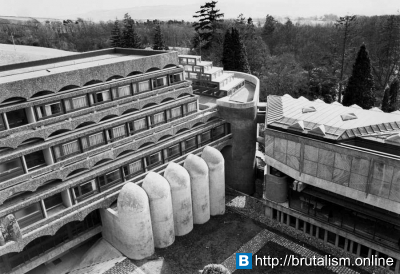 Determinedly modernist, brutalist and owing a huge debt to Le Corbusier, the seminary is widely considered to be one of the most important examples of modernist architecture in Scotland. 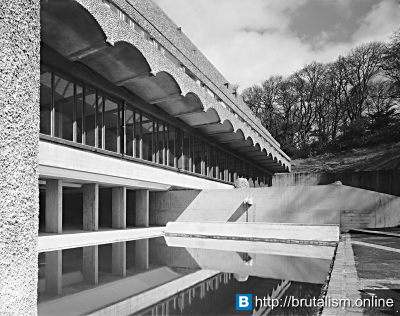 "The architecture of Le Corbusier translated well into Scotland in the 1960s. Although the climate of the south of France and west of Scotland could hardly be more different, Corbu's roughcast concrete style, could, in the right hands, be seen as a natural successor or complement to traditional Scottish tower houses with their rugged forms and tough materials", wrote Jonathan Glancey. Filmmaker Murray Grigor made a documentary about the building entitled Space and Light, while Glasgow artist Toby Paterson has painted it. By the time it was completed in 1966 the number of candidates entering the priesthood had begun to decline. As a result, the building never reached its full capacity of around 100 students. From the outset, the building was riddled with problems, including maintenance difficulties with such a unique structure and significant water entry; the architects and owners each blamed the other for these problems. In February 1980, the buildings closed as a seminary. The Archdiocese of Glasgow moved St Peter's College to Newlands. St Peter's College, Newlands remained until November 1984 when it was closed and transferred its students to Chesters College. 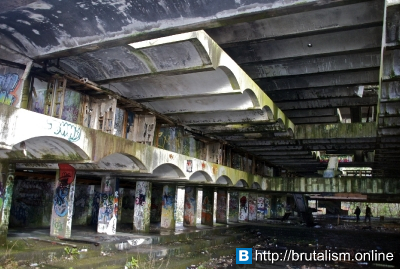 The Cardross site subsequently becoming a drug rehabilitation centre. However maintenance problems with the modern buildings remained, and accommodation for the recovering drug addicts centred mainly on the old Kilmahew House, which was in a better state of repair. The drug rehabilitation centre closed by the end of the 1980s. In 1995, a fire so badly damaged Kilmahew House that it was deemed too unsafe to stand and was demolished. The buildings were Category A listed by Historic Scotland in 1992, and in October 2005 was named as Scotland's greatest post-WWII building by the architecture magazine Prospect. Nonetheless, the building remains a ruin. Most of the woodwork and glass is now gone, although key aspects of the original design are still clearly visible. According to the architecture writer Frank Arneil Walker, "nothing prepares one for the sight of the new grown prematurely old." Attempts to convert and reuse it, or even protect it from further damage, have come to nothing – hampered by the unique design of the building and its remote location. Plans have included building a 28-unit housing development in the building's grounds, and stabilising the structure by stripping it back to its concrete skeleton, possibly fully restoring a small cross-section. This is a source of concern for conservation bodies including the Twentieth Century Society, who have placed it on their Risky Buildings Register, arguing that this would destroy much of the remaining fabric of the building. In June 2007 it was announced that the building was to be included in the World Monuments Fund's 100 Most Endangered Sites list for 2008. Also in 2007, developer Urban Splash became involved. Urban Splash worked with architect Gareth Hoskins, and in 2009 environmental arts group NVA were awarded a grant by the Scottish Arts Council to develop temporary and permanent artworks as part of the redevelopment of the building and surrounding woodlands. In 2011, Urban Splash pulled out of the project due to viability issues, and the Archdiocese of Glasgow reiterated its view that no commercial scheme will be viable for the site . NVA, however, have continued their involvement with the site, working with local community groups, raising funds and developing plans for the partial restoration of the seminary buildings and interventions in the surrounding landscape. In 2010, NVA presented these plans at the 12th International Architecture Exhibition at the Venice Biennale. In 2012, the Scottish Government gave £500,000 for the building's regeneration by a Historic Scotland building grant. Also in 2012, NVA began working in partnership with the Universities of Glasgow, Edinburgh and Strathclyde on the 'Invisible College', a research network which aims to radically reinvent the college's original teaching function for the present day. A 'college without walls', the Invisible College has involved organised events bringing together academics, local residents, architects, artists and other interested parties on site for debate, discussion and collaborative investigations in the landscape. There have been public talks about ruins, architecture and landscape in the nearby villages of Cardross and Renton, and in the Lighthouse in Glasgow. The college has also produced an 'audio drift', a sound work layering together environmental recordings and interviews, designed to be listened to on portable MP3 players whilst walking through the landscape, and a guided walk around the Kilmahew estate, in collaboration with the Royal Geographical Society. Local residents from Cardross have begun cultivating food in the ruined walled garden of the former estate, which once supplied food for Kilmahew House and later the seminary. Following on from this, in 2013 the Invisible College is organising a series of events exploring the horticultural and food-producing aspects of the site. The Invisible College has been funded by the UK Arts and Humanities Research Council (AHRC).